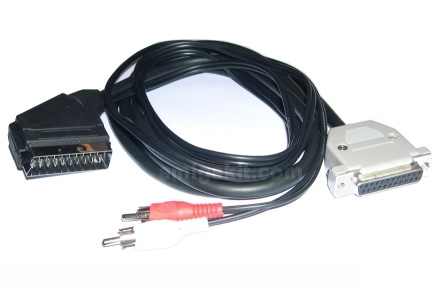 Connect your Amiga to a SCART RGB television and experience superior picture quality over normal RF and composite AV cables with this RGB cable. Cable is 3m long (approximately 9 foot long) and terminates one end in a standard SCART male connector. The other end terminates in 2x phono male connectors: Audio Left, Audio Right and 23-pin female RGB Video connector. The cable is also optimised for use with modern LCD Televisions. Installation is easy: when the Amiga is powered down, connect the cable to the 23-pin video port on the rear of the Amiga and connect the Left and Right audio connectors. Finally plug the SCART connector into the SCART RGB socket on the rear of your television. Compatible with Amiga A500, A500+, A600, A1200, A1500, A2000, A3000, A4000, A4000T. Please Note: due to the lack of supply of 23-pin connectors, we are now forced to supply trimmed 25-way modified connectors which have been cut down to 23-way (2x holes removed). These modified connectors will fit the Amiga's video port without any problems.